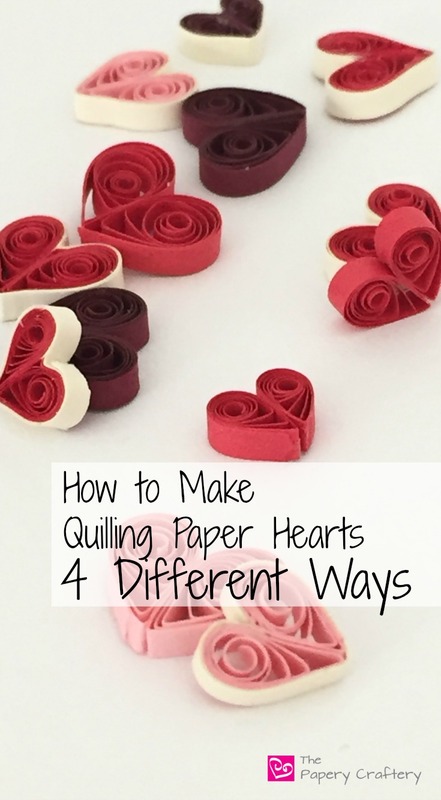 HomeHow to Make Quilling Paper Hearts : 4 Different Ways! If you follow me on any social networks, it is no shocking news that I’m super excited that Valentine’s Day is on it’s way. I get all mushy about love stories, romantic movies and red and pink heart decorations. Plus, the gift boxes full of chocolate aren’t anything to sneeze over. So I thought I’d write up a tutorial on how to make quilling paper hearts: 4 different ways. For the most traditional heart, all that’s needed are two strips of quilling paper, each the same length. I used 6″ strips for this demo to quill hearts that would be about 3/4″ when finished. The smaller heart in the photo below was made with 2 4″ strips of paper. Of course, bigger is ok, too! Roll each strip into a coil, then pinch into a teardrop. If you need a reminder on how to create basic quilling shapes, take a look at my coil video. Add a little glue between the two teardrops, push them together and let dry. If you’re like me and you’re a quiller who uses straight pins, it can be helpful to use a few at this point to keep the 2 halves of the heart as close together as possible while they are drying. Other wise, hold them in place until dry. Once the basic heart is formed, you can jazz it up a bit by adding an outline of a contrasting color. Below, I show how I added another layer to a traditional red heart with an ivory strip. I start in the top center of the heart and add a very small dot of glue (remember with quilling, less is always more!). Next, I place a torn end of the new color into the glue and let it set. Once dry, I wind the strip around the outside of the heart, using a teensy amount of glue around the entire edge as I go. Once I get to the center, I use my needle tool to push the ivory strip into the center of the peak of the heart, so it can follow the shape exactly. In order to really make the outline pop, wrap the heart at least 2 times. For the third type of paper heart, I thought that instead of a written tutorial with photos, it would be easier to follow a video. Lastly, I’m going to include a throwback tutorial that I wrote a while back for the Examiner.com. I still use this approach to quilling all the time and I have a few examples for sale in my Etsy shop right now! Update: Don’t forget to stop by my latest Valentine’s Day post to learn how to create some super-sweet and simple 3-D hearts, too! Do you have another way to quill paper hearts? I’d love to hear your technique! Leave a comment below and tell me all about how you make yours! I’m excited to have found this site! I’ve been quilling for years, but hadn’t done much lately. I’ve been trying to find directions or patterns for more advanced projects, but I’m having trouble finding them. I see lots of samples, but no directions, measurements, etc. do you have anything like that? Or suggestions on where to look? Thanks. That’s so wonderful to hear, Kristy! I’m glad you’ve found me too! My site definitely has a lot of tutorials with measurements, but more for beginners to intermediate quillers, and with my own twists. When I do my own work, I draw my own patterns. But I am on a great Facebook group of quilling paper artists that might have more of a direction for you. I hope that helps a bit! If there is anything else I can help with, please let me know. Send me an email anytime at Meredith@thepaperycraftery.com.